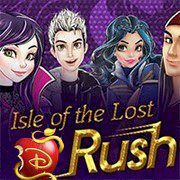 Descendants are having fun on the island and they need your help to complete assignments. Jump and do what you were asked to do. Are you ready to help descendants to complete some challenging runs on the island? This will make you pass to the next, more challenging level. But first, you need to make sure that three objectives are done.